WALTHAM, MA, UNITED STATES, August 1, 2018 /EINPresswire.com/ -- OnPage, the leader in Incident Alert Management and critical communications, announces its partnership with Swan Island Networks, provider of premier threat monitoring and situational awareness services. The collaboration provides security firms, risk management teams and security professionals with a way to automate audible alerts from intelligent channels and dashboards so that immediate action can be taken on critical real time threats. This partnership enables the protection of enterprises, assets, and people with real time alerting. 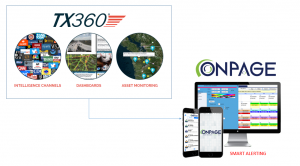 The TX360 platform, developed by Portland, Oregon based Swan Island Networks enables users to monitor information channels and data feeds for critical information. Their unique dashboards monitor threats and disasters in real time and can factor in location-based monitoring to cover assets in multiple locations.